Visiting the city and its various neighbourhoods is both fun and interesting as we all know this is a cultural city that is full of charming places waiting to be discovered. However, too often, the average tourist gets to see the city's main attractions such as the Cathedral of the Sagrada Familia, Casa Battlò, La Pedrera and Park Güell etc., forgetting that Barcelona isn't just about these particular places. Our Tour Guide Service, in addition to providing the opportunity to visit the aforementioned attractions, also makes it possible to visit some of the less well known corners of the the city which are frequently overlooked in the guide books but are also very famous and which are thus less likely to be visited except with a guide. 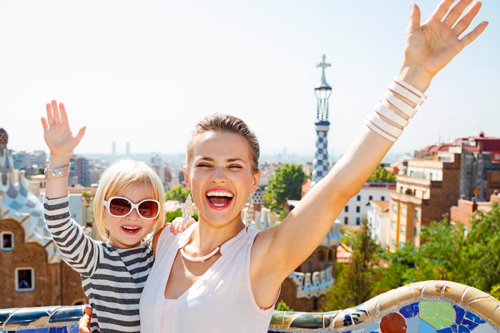 The Tour Guide Service in Barcelona provides itineraries that have been put together by various different operators and also makes it possible for the client to decide which places they wish to be accompanied to. In other words, the service can be completely bespoke. Making a booking via the form on this page will provide you with the opportunity to choose an English speaking guide to accompany you, someone who knows the city intimately and will make it possible for you to visit some of the most enchanting parts of the city which are less well known, such as, for example, the Born barrio (neighbourhood) with the best places in which to sample the most delicious tapas. The service also provides a pre-purchase contact, in other words, the client can ask to be put in touch with a guide or the person who will accompany them prior to buying the service so as to answer any questions they may have. Entrusting yourself to an expert guide when visiting Barcelona is the perfect choice for any kind of tourist. In fact, booking just one guided tour (for the duration of your choice) means you will be able to ask the guide for all the advice you would like to have and being able to move around the city centre in complete comfort. If you were to book your guide for the first day of your visit to the city, you would be able to ask for detailed advice about the best places to visit in the coming days and also to obtain information about the best and most typical restaurants which are worth trying. In addition to this, why stress yourself out trying to get your bearings in the historic city centre which is something of a labyrinth? Let yourself be guided by a local expert who has an in-depth knowledge of all the most beautiful streets and many of the city's hidden charms. On this page, you will be able to book the best guides to Barcelona who will be able to recommend the most enchanting and typical areas of the Catalonian capital. This can also incorporate a private car service (with a driver, who won't just be your driver but also your guide). For further information, visit the page: Tour Barcelona by car. Why should you choose to use a local guide? Set yourself free from any worries about communcation. Visit Barcelona with a guide who speaks your language! A tour with a Guide will really enrich your stay, ensuring that it becomes an unforgettable experience. The convenience of booking a Guide service in your own language, coupled with the freedom to choose: how, where and when you wish to make your guided tour. Through the booking form, the client will be able to select the duration of the tour and the itinerary (or decide to leave it to the experts' advice), the timetable and the meeting point. If you wish, you can also request that the meeting point will be where you are staying. You just have to state your preferences on the booking form and we will take care of the rest. Package deal lasting 8 hours, (€280.00): a stroll through the historic centre or a visit to four attractions of your choice or, alternatively, a stroll for four hours and two attractions of your choice. The official guide is our excellent service, the one that every tourist wishes to visit the best attractions of Barcelona in Spanish. It is a professional guide with the certified book of the European Union and Catalonia. Our guides are highly specialized and can respond to any kind of historical-cultural curiosity you want to ask. The service has a fixed cost that you can divide with the people of your group. The unofficial guide is our economic guide service, which allows each tourist to visit the most beautiful neighborhoods of Barcelona and the facades of the most important buildings with a real expert of the city. Our guides are Spanish boys and girls, who have lived in Barcelona for more than 5 years, and know the city perfectly. It is an economic service, since the guides can accompany you outside the attractions, but they are not allowed to enter. The guide service has a fixed cost, which you can divide with the people of your group or family, saving without sacrificing the quality of a guide service in Spanish. The official guide also performs a shared guide service, that is, not reserved guided tours only to your group, but to which other participants may join. In this case, the service includes the entry into the price, the guide service in Spanish is only available on specific days and only in spring / summer. In order to visit our large tour proposal in Barcelona, please visit our dedicated section on the following page: Barcelona Tours. Book your private guide service now by simply filling out the form on this page. Complete all the required personal details which will be treated with utmost respect in regards to your privacy and will be used solely for the purposes of this booking, effect the payment of a small deposit, the balance will be payable directly to your guide on the day of your visit. Upon receipt of the deposit, you will receive an email with all the details of your booking and the booking confirmation.